12 décembre 2016 par Michèle T.	| Nos suggestions adultes. Langue : Anglais. Genre(s) : Historical, Mystery. London, 1885. In a city of fog and darkness, the notorious thief Edward Shade exists only as a ghost, a fabled con, a thief of other men’s futures — a man of smoke. William Pinkerton is already famous, the son of a brutal detective, when he descends into the underworld of Victorian London in pursuit of a new lead. His father died without ever tracing Shade; William, still reeling from his loss, is determined to drag the thief out of the shadows. Adam Foole is a gentleman without a past, haunted by a love affair ten years gone. When he receives a letter from his lost beloved, he returns to London in search of her; what he learns of her fate, and its connection to the man known as Shade, will force him to confront a grief he thought long-buried. What follows is a fog-enshrouded hunt through sewers, opium dens, drawing rooms, and seance halls. Above all, it is the story of the most unlikely of bonds: between William Pinkerton, the greatest detective of his age, and Adam Foole, the one man who may hold the key to finding Edward Shade. 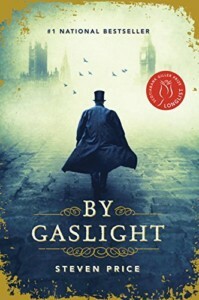 Epic in scope, brilliantly conceived, and stunningly written, Steven Price’s By Gaslight is a riveting, atmospheric portrait of two men on the brink. Moving from the diamond mines of South Africa to the battlefields of the Civil War, the novel is a journey into a cityscape of grief, trust, and its breaking, where what we share can bind us even against our darker selves.